It’s Presidents’ Day and that means a number of clothiers have launched sitewide sales. You’ll find deals from popular brands like Patagonia, Gap, J.Crew, Banana Republic and more. Our favorite promotion today is over at Eddie Bauer. Today’s sale includes discounts up to 60% sitewide plus an extra 50% off clearance items. This is one of the stronger deals that Eddie Bauer has offered, we rarely see this type of discount on clearance-priced items. 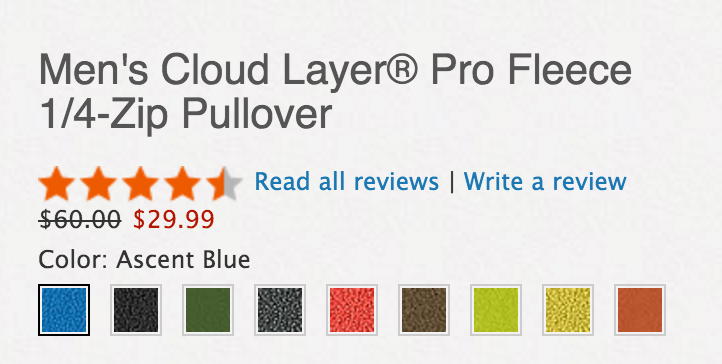 My top-pick here is the Men’s Cloud Layer Pro Fleece 1/4-zip Pullover for $29.99 shipped. This top usually goes for $60 and is available in nine colors. Its “lightweight” 5.5 oz. fabric features an anti-pill finish that will “prevent signs of long-term wear”. The chest pocket is a perfect spot for your iPhone. I have a few of these tops, they are perfect for this time of year. Amazon is chopping an additional 20% off clothing, shoes, watches and jewelry when you enter coupon code PRESDAY20 at checkout. Thousands of items for men, women and kids are eligible for this promotion. One of our favorite deals is the New Balance Men’s MW659 Country Walking Shoe for $31.98 Prime shipped (Reg. $40). That’s a savings of $8 and the lowest price we’ve seen. Rated 4.1 out of 5 stars from more than 200 Amazon reviewers. Our premier layering fleece for active endeavors, from alpine climbing and skiing to all-season travel. Made with ultrasoft Polartec® Classic Micro Velour fleece, renowned for setting the standard for superior performance. It provides lightweight warmth, dries quickly, and resists pilling. Streamlined design for easy layering without bulk or binding.